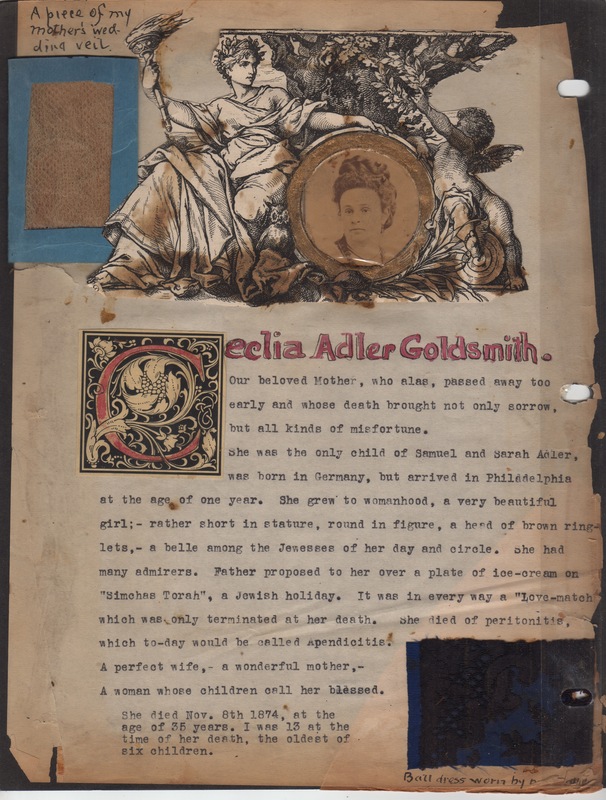 After writing about the two oldest sons of Abraham Goldsmith and Cecilia Adler, I am glad to be able to turn to their daughter Rose. 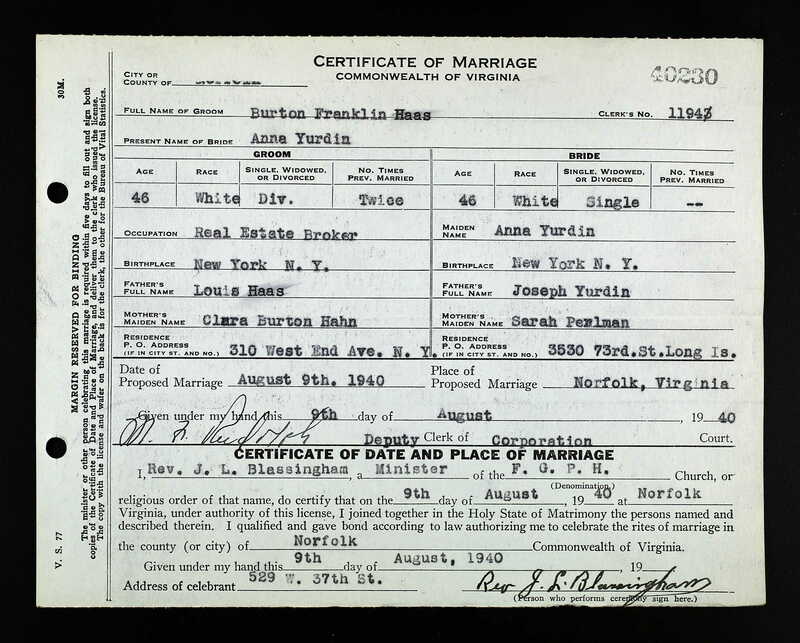 Rose was born on October 19, 1866, in Philadelphia, and as I wrote here, she married Sidney Morris Stern on May 25, 1892, when she was 26. Sidney was born January 14, 1861, in Philadelphia, and was the son of Morris Stern and Matilda Bamberger, who were German-born immigrants. His father was in the retail clothing business. Sidney was a jeweler. 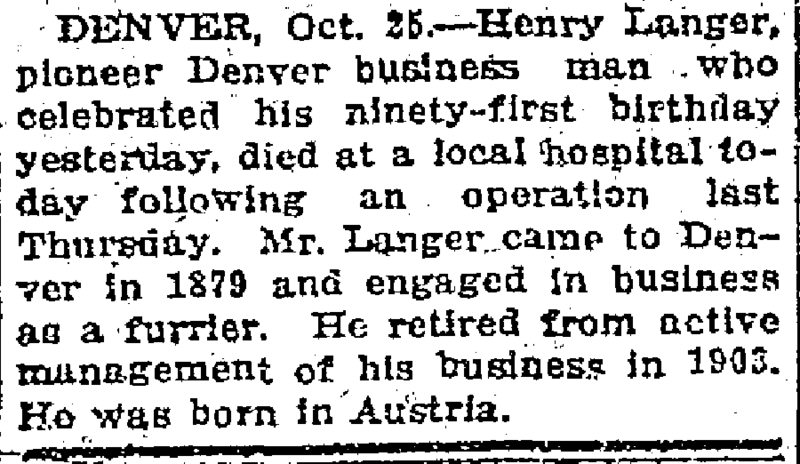 UPDATE: Thanks to a question asked by my cousin Jennifer about Sidney’s mother Matilda Bamberger, I discovered another twist in my crazy family tree. 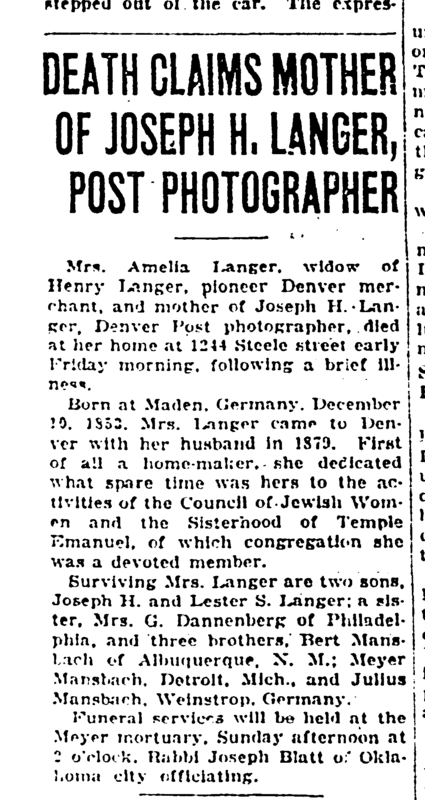 In looking to answer Jennifer’s question, I realized that I had two women named Matilda Bamberger on my tree, both married to Morris Stern. They were obviously duplicates. 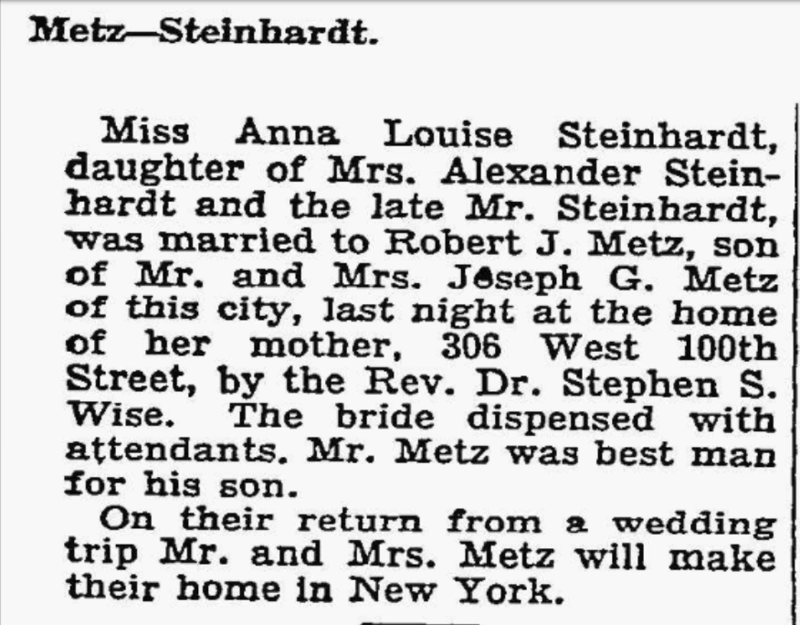 Looking more closely, I realized that Matilda and Morris Stern’s daughter Clara Stern was the mother of Julian Simsohn, who married Edwin Goldsmith’s daughter Cecile. In another words, Cecile married the nephew of her Aunt Rose’s husband Sidney. 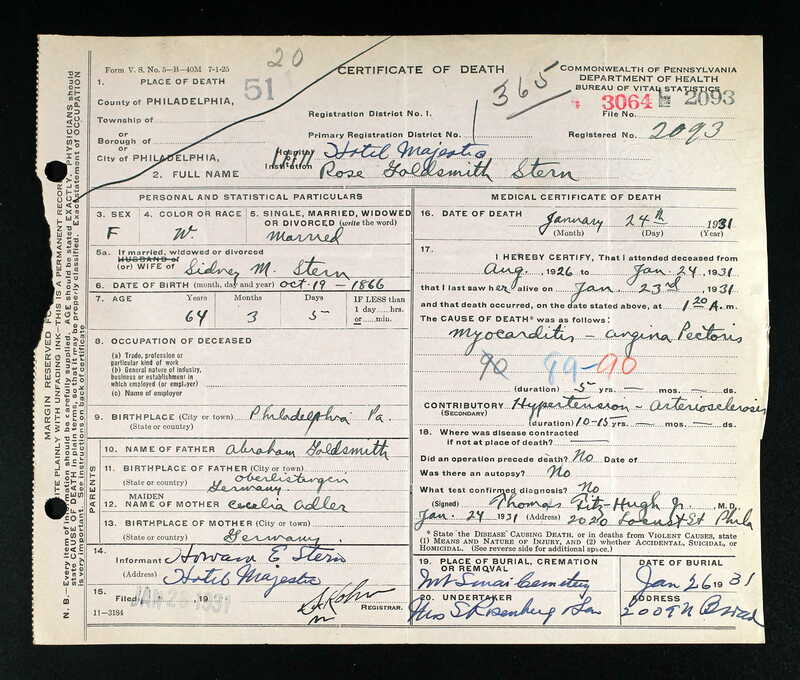 That earlier post also reported that Rose and Sidney’s first child, Sylvan Goldsmith Stern, was born on March 2, 1893. 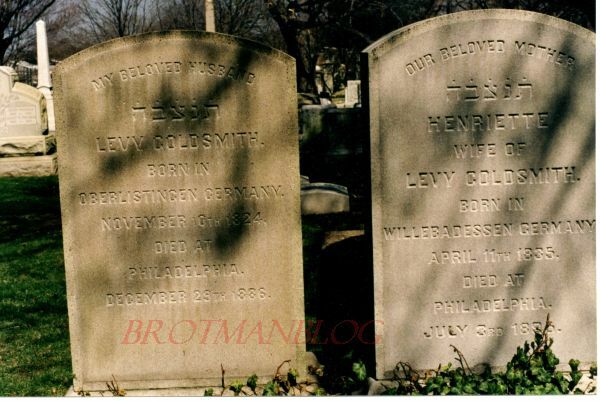 Two years later Rose gave birth to twin boys, Allan Goldsmith Stern and Howard Eugene Stern, on August 6, 1895. 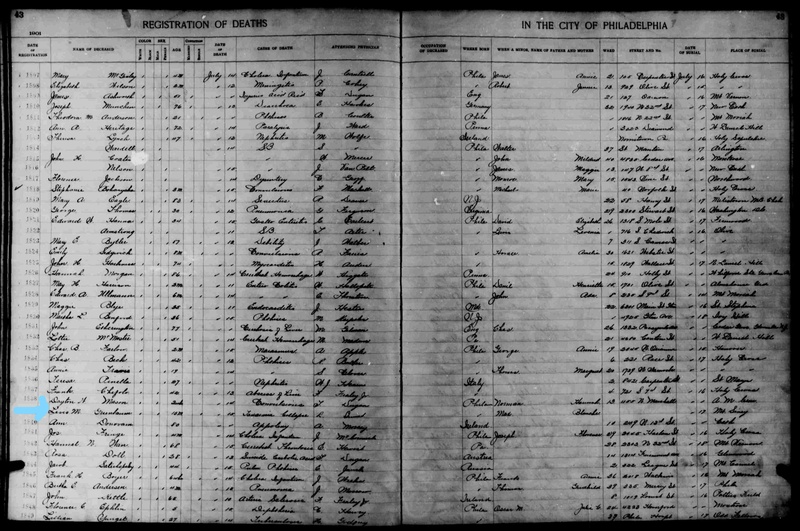 I could not find Rose and her family on the 1900 census despite having their address in 1899, 1900, and 1901, but based on listings in the Philadelphia directories for those years,1 I know that she was living in Philadelphia with her husband Sidney and their two younger sons, Allan and Howard. Sidney was in the jewelry business with his brother Eugene. However, their oldest son Sylvan, who was seven at the time, was not living with them in 1900. 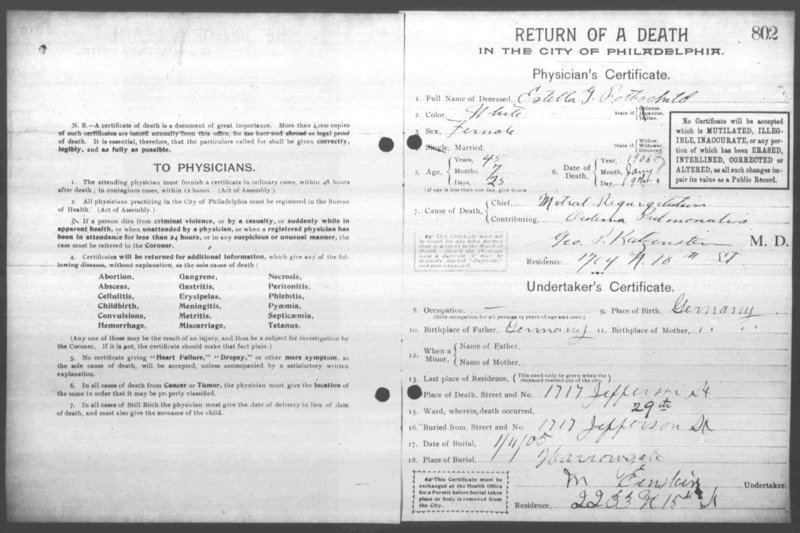 He was living at the Pennsylvania Institution for the Deaf and Dumb in Philadelphia; according to the census record, he could not read, write or speak English at that time. From later records I learned that Sylvan was completely deaf. 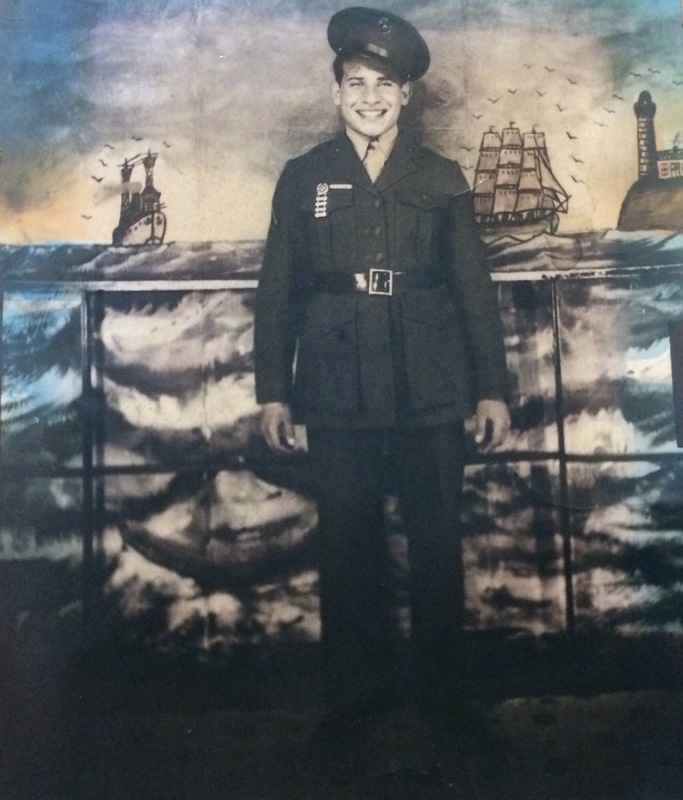 In 1915, when he was 22, Sylvan was living in Riverton, New Jersey, in a household with four other men: two men from Holland whom I presume were brothers, Peter and Anthony Hooydonk, a German immigrant named Ferdinand Frohlich, and a Pennsylvania native named John Peguesse. All five men were in their early twenties and all were working in the florist business. Riverton is a small residential community about fifteen miles from Philadelphia across the Delaware River. 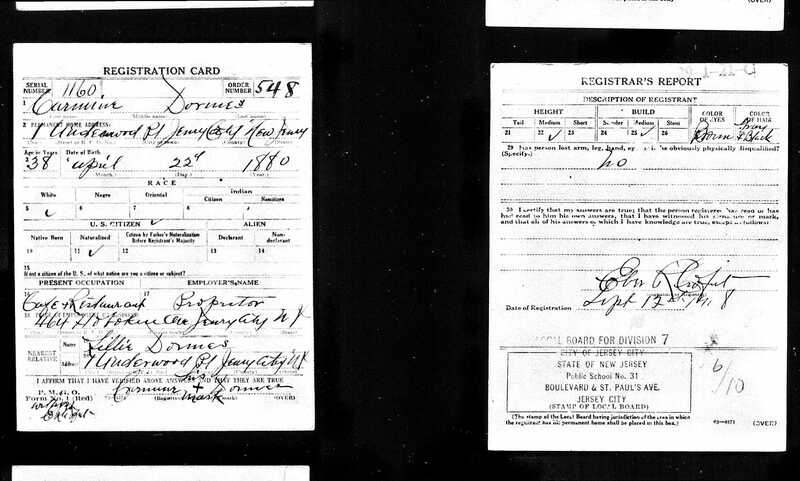 In 1917-1918, all three of Rose and Sidney’s sons registered for the World War I draft. 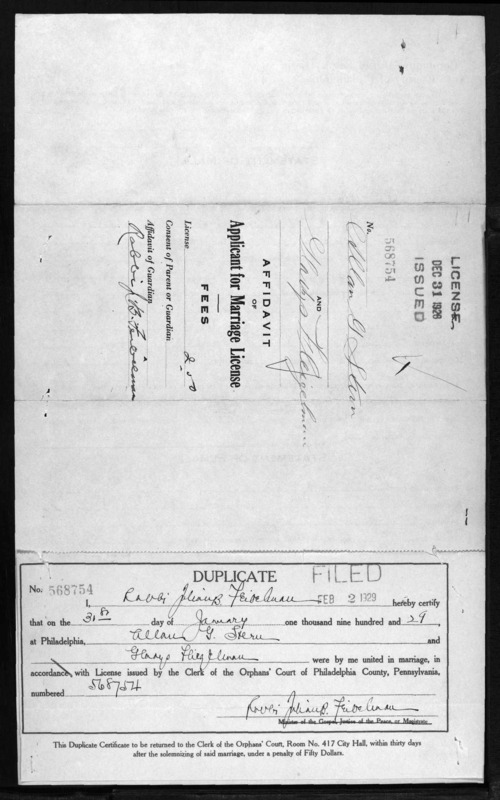 Sylvan reported that he was living at 1613 Poplar Street in Philadelphia, but working as a nurseryman in Riverton, New Jersey, for Henry A. Dreer, Inc. He also reported that he was totally deaf. Allan was living at the same address and reported that he was a college student, and Howard, also living at the same address, was employed as a farm laborer by Florex Gardens in North Wales, Pennsylvania, which is about 25 miles from Philadelphia. 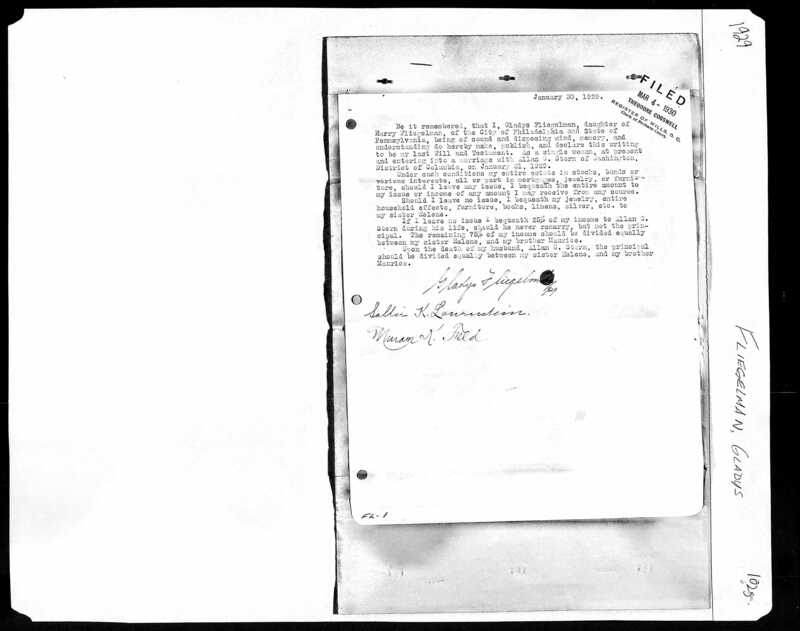 Allan served in the Army’s Bureau of Standards in Washington, DC, from March 15, 1918, until January 8, 1919, when he was honorably discharged.4 I did not find any record of military service for Sylvan or Howard. 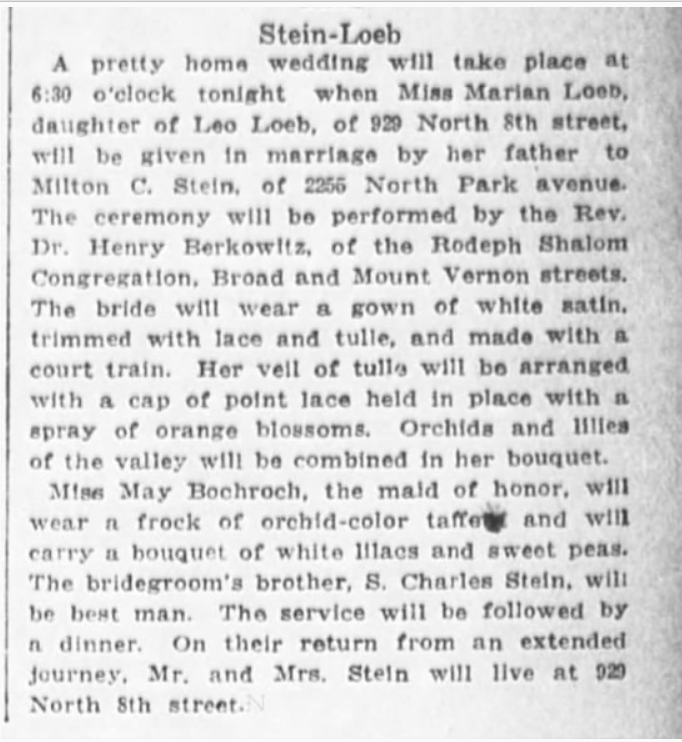 All three Stern brothers were married in the 1920s. 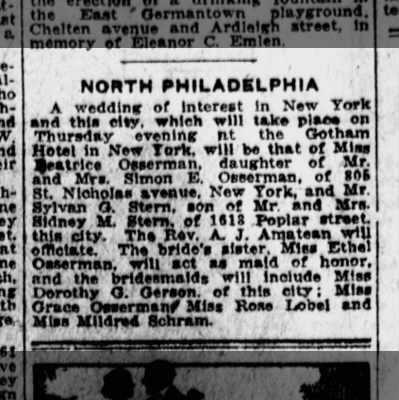 First, on May 26, 1921, Sylvan Goldsmith Stern married Beatrice A. Osserman, the daughter of Simon E. Osserman and Dora Kessner in New York City. According to a source I found, Beatrice was, like Sylvan, deaf; she was born in New York City on October 30, 1899. 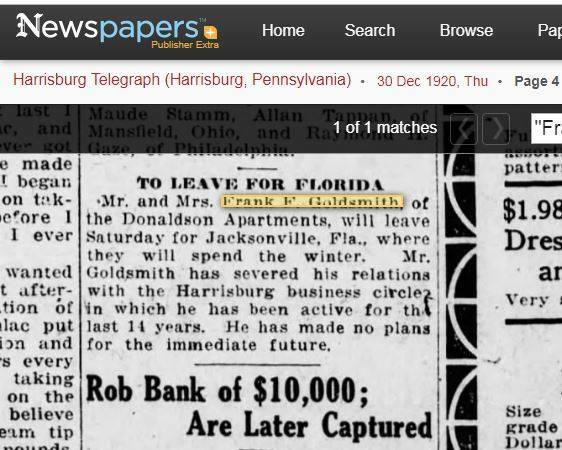 Her parents were immigrants from Russia/Latvia, and her father was in the real estate business in 1920.6 This news item from the Philadelphia Evening Ledger reported that one of the bridesmaids was Dorothy G. Gerson, Sylvan’s first cousin and the daughter of his mother’s sister, Emily Goldsmith Gerson. Sylvan and Beatrice had two children during the 1920s. Howard and Madeline would have two children. 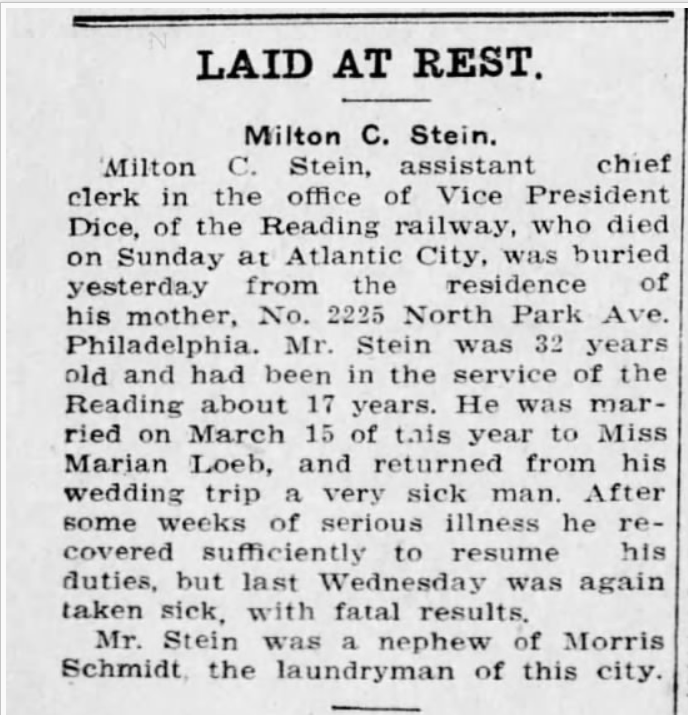 The last son to marry was Allan Stern, and his wife’s story is quite tragic. 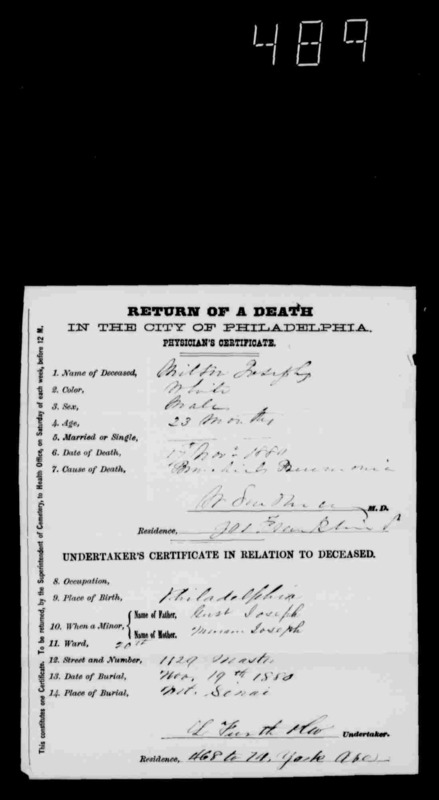 The Philadelphia, Pennsylvania Marriage Index on Ancestry reports that Allan married Gladys Fliegelman,9 daughter of Harry Fliegelman and Gussye Fridenberg, in 1928, but I learned an important lesson about that index while researching their marriage. More below. 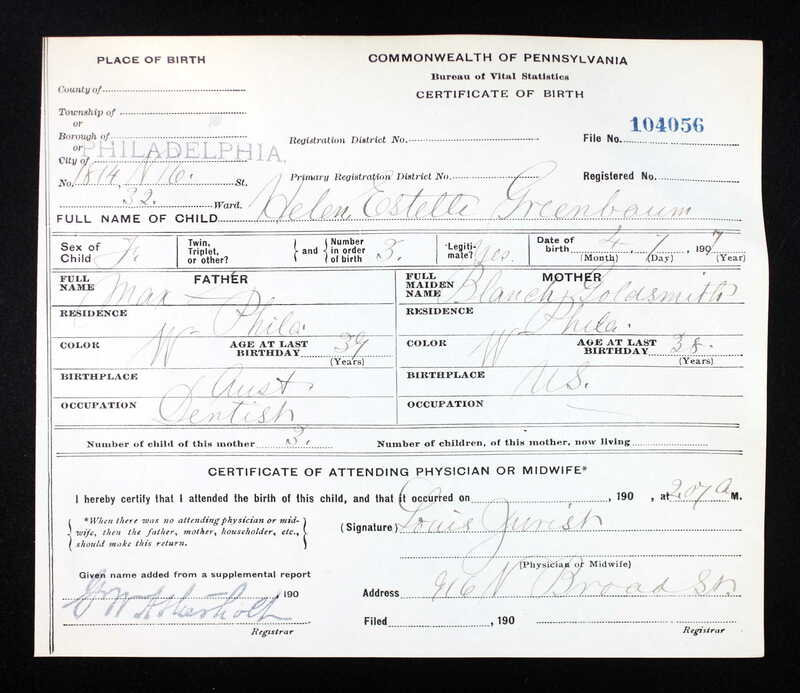 Gladys was born on April 23, 1904, in Philadelphia.10 Two years later on June 30, 1906, her mother Gussye suffered complications after giving birth to a second child and died six weeks later on July 17, 1906, from parenchymatous nephritis or kidney disease. 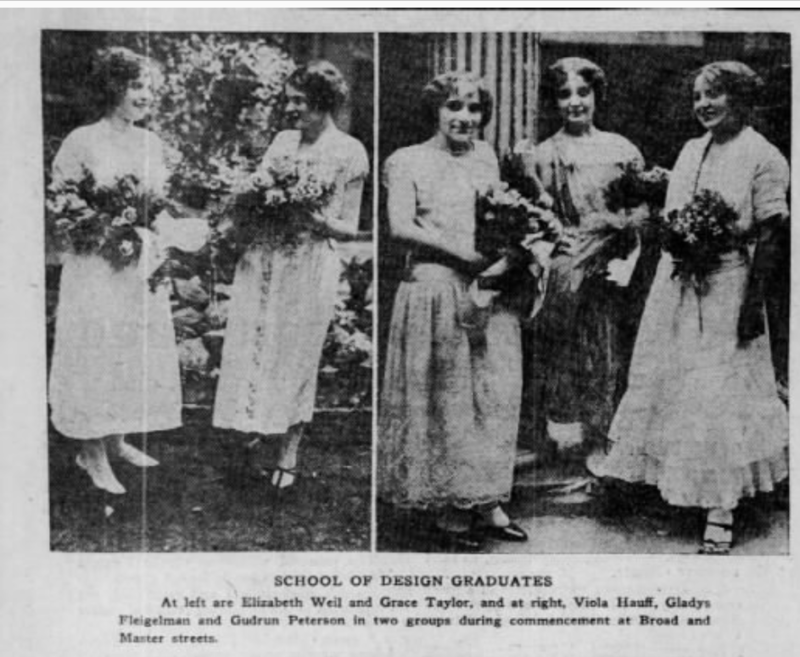 In 1924, Gladys graduated from the Philadelphia School of Design for Women; her photograph appeared in the Philadelphia Inquirer with some of her classmates. She is in the middle of the photograph on the right. 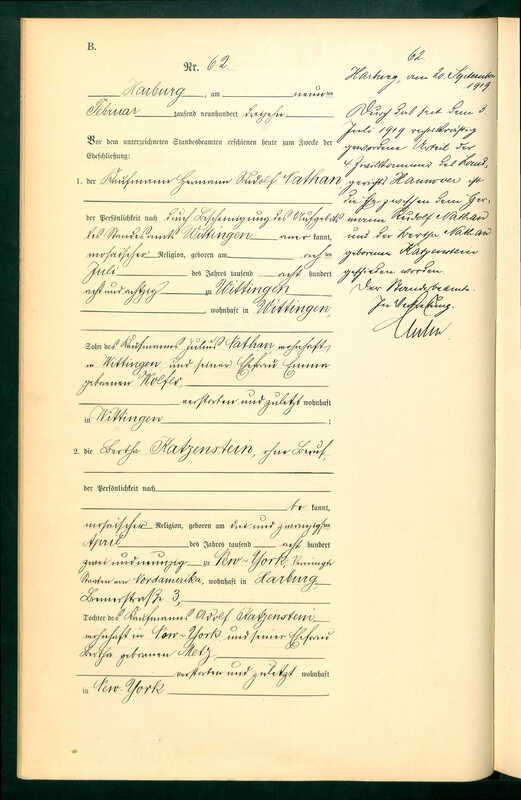 Probate Records (District of Columbia), 1801-1930; Author: District of Columbia. 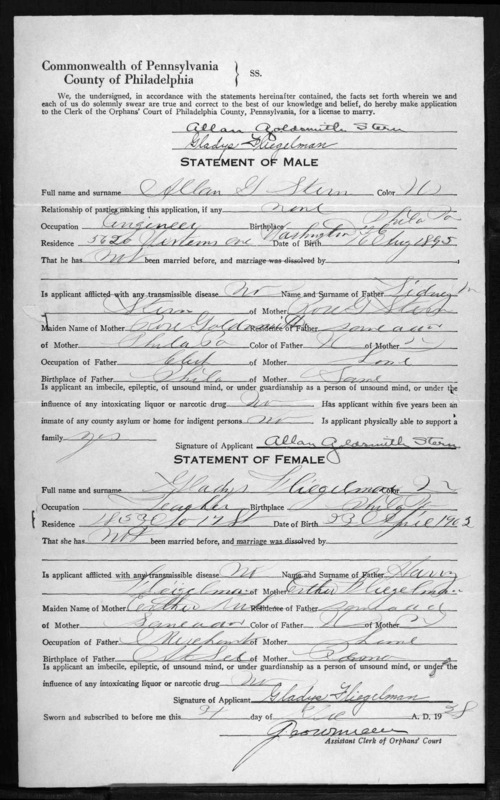 Register of Wills; Probate Place: District of Columbia, Washington, D.C.
Gladys refers to herself as “a single woman, at present, and entering into a marriage with Allan G. Stern of Washington, District of Columbia, on January 31, 1929.” Since the Ancestry database of Philadelphia marriages indicated that they were married in 1928, why did she describe herself as single on January 30, 1929? And this is where I learned something new. 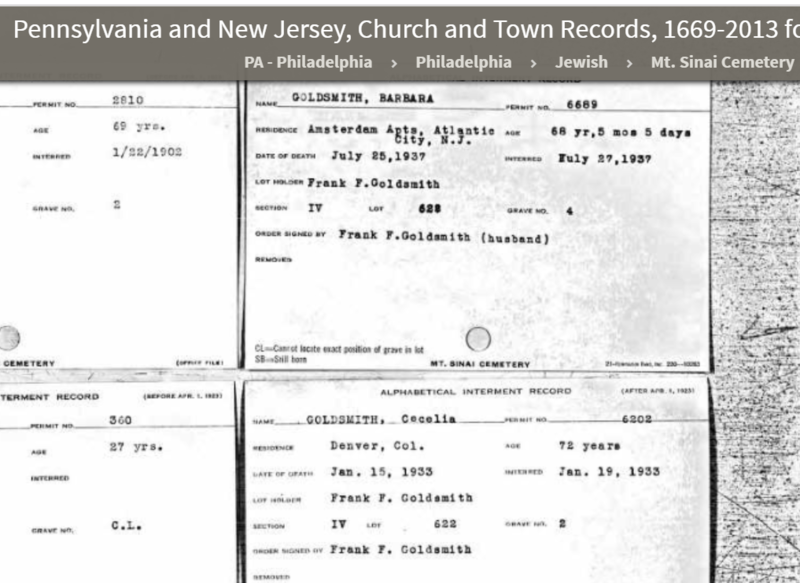 In discussing something completely different on the Tracing the Tribe Facebook page, a member there named Sharon Roth pointed out that FamilySearch has images of the Philadelphia marriage licenses and certificates. 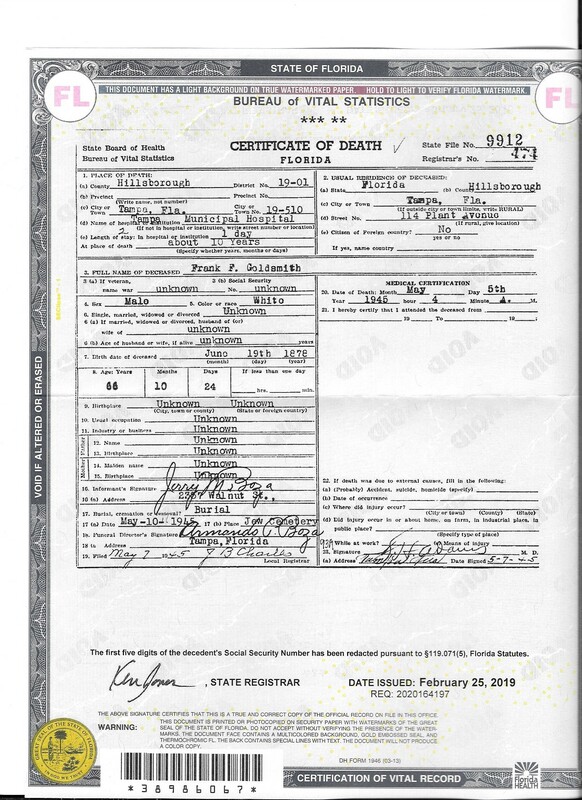 They are not indexed for searching, but once you know the marriage license number from the index on Ancestry or FamilySearch, you can find the underlying documents by searching through the database of images by date and number. 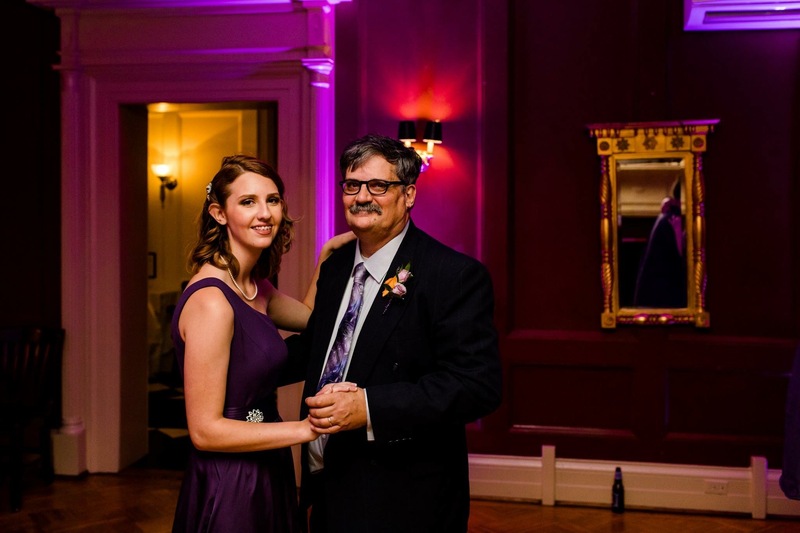 This was a database that I could not find when I searched the FamilySearch records listings, so I am not sure how I would have found it without Sharon’s help. You can find the two databases here and here. 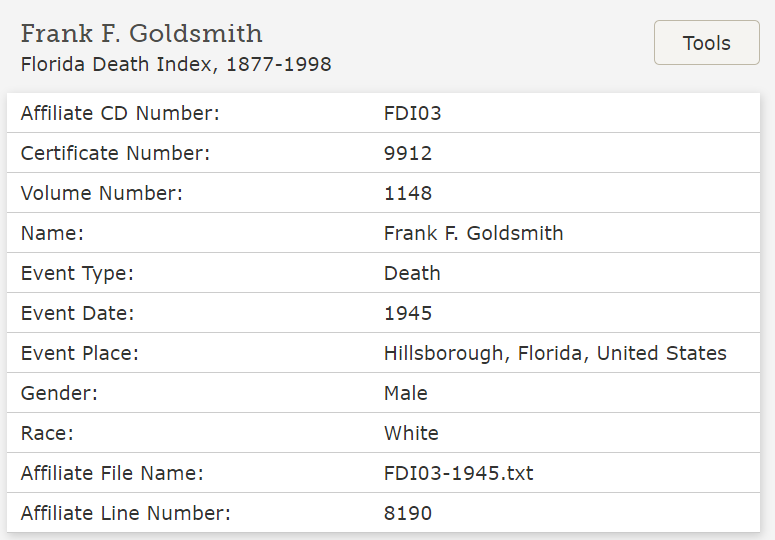 Thank you to Sharon and to Amberly of The Genealogy Girl for showing me how to find these databases through the catalog on FamilySearch so that I now can find all these “hidden” databases. Amberly had actually blogged about this over a year ago, but I’d forgotten about her tips. You can learn more from her blog here. 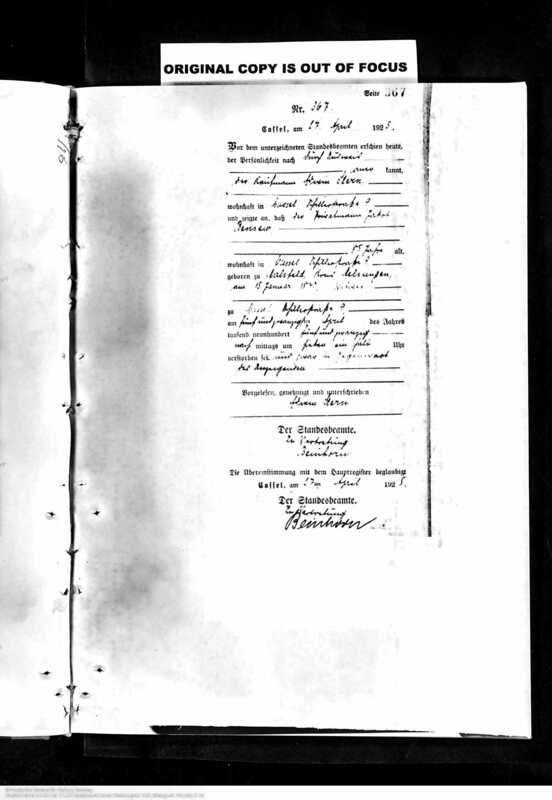 With this new information, I was able to find the license and the rabbi’s certificate of marriage for Allan and Gladys. 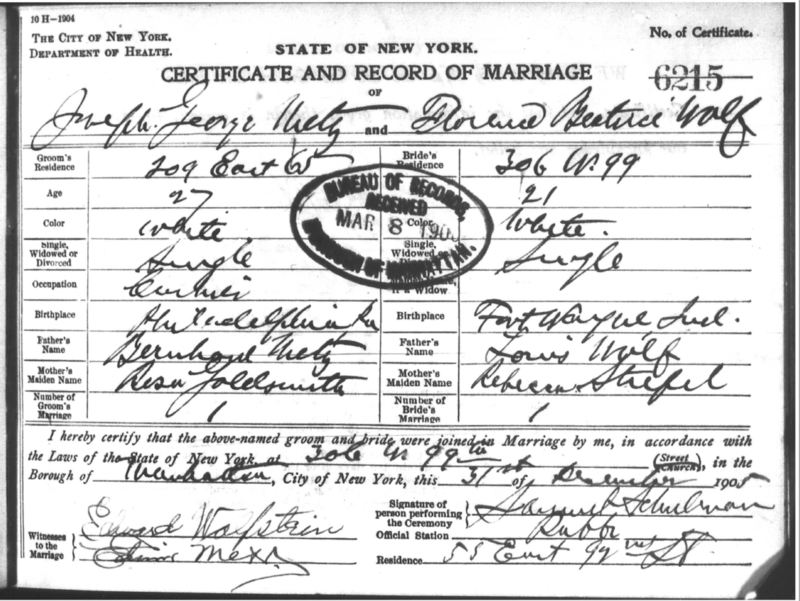 Now I know that although their marriage license was issued on December 31, 1928, they were not in fact married until January 31, 1929, the day after Gladys drew up her will. Returning to the will, its contents strike me as somewhat odd. Gladys bequeathed all her property and income to any issue she might have at the time of her death; that is, whereas one might assume that her husband would inherit before her children, Gladys wanted her estate to go directly to her children. Moreover, her will provides that if she died without issue, her sister would inherit all her personal possessions. Allan would only inherit 25% of her income and only for as long as he did not remarry. 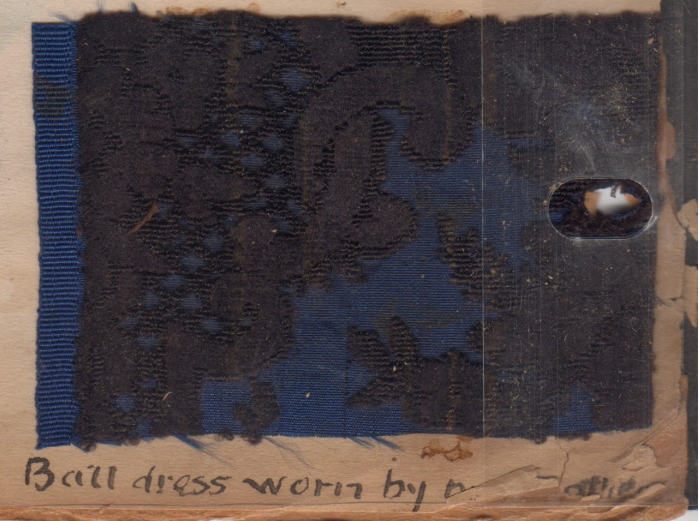 Gladys’ sister and brother would receive the other 75% of her income and the principal when Allan died. 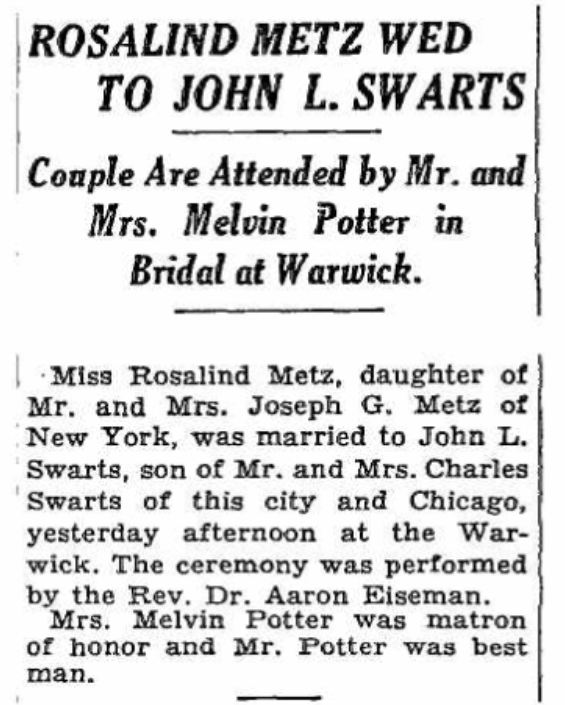 Now call me a romantic, but this seems like a rather unromantic way to start a marriage—leaving your husband such a limited part of your estate. 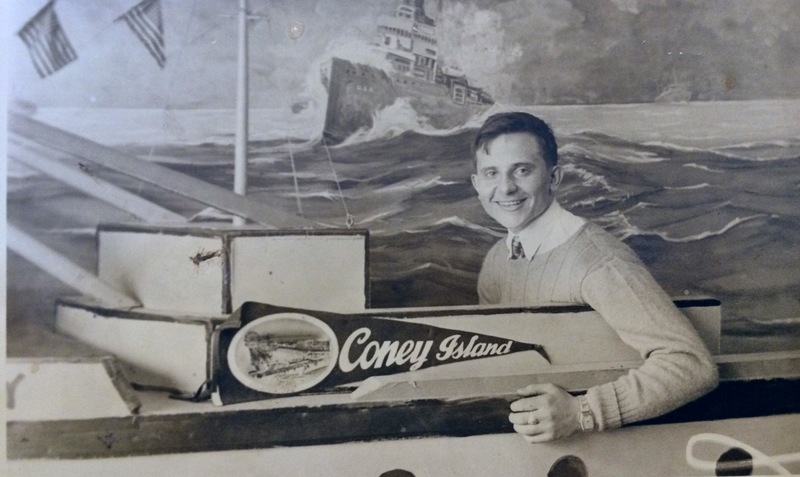 Thus, the new decade began on a heartbreaking note for the family of Rose Goldsmith and Sidney Stern and their sons, especially for their son Allan. 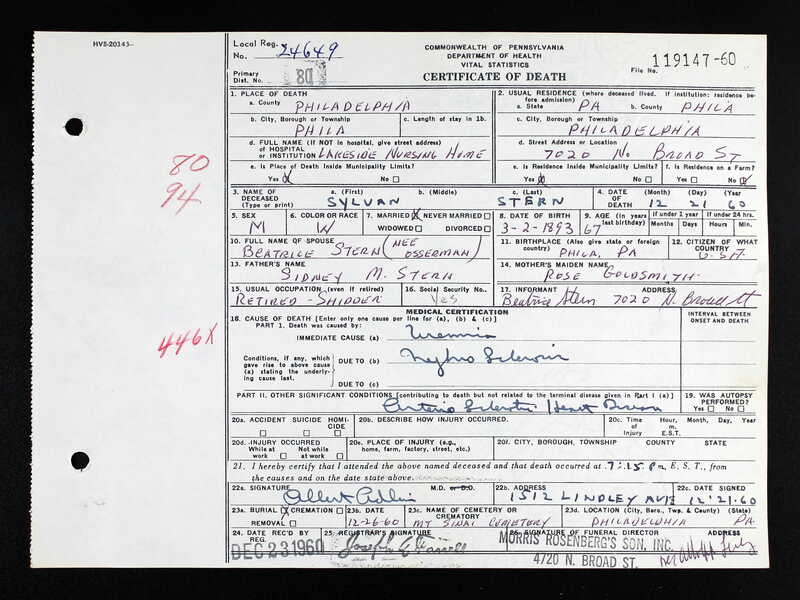 Sylvan Stern and his family continued to live in Philadelphia in 1940, and Sylvan was still working as a packer in a sporting goods store at that time.21 According to his 1942 draft registration, his employer was Edward K. Tryon Company.22 Sylvan died on December 21, 1960. He was 67 years old. 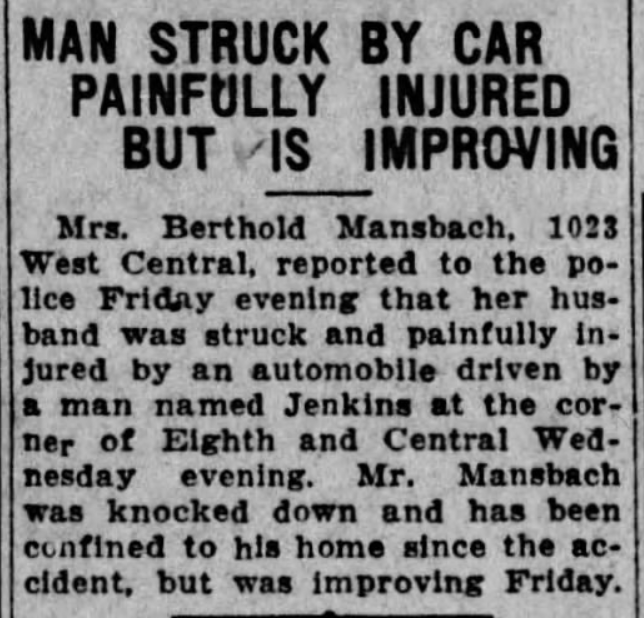 He was survived by his wife and children and his two brothers. 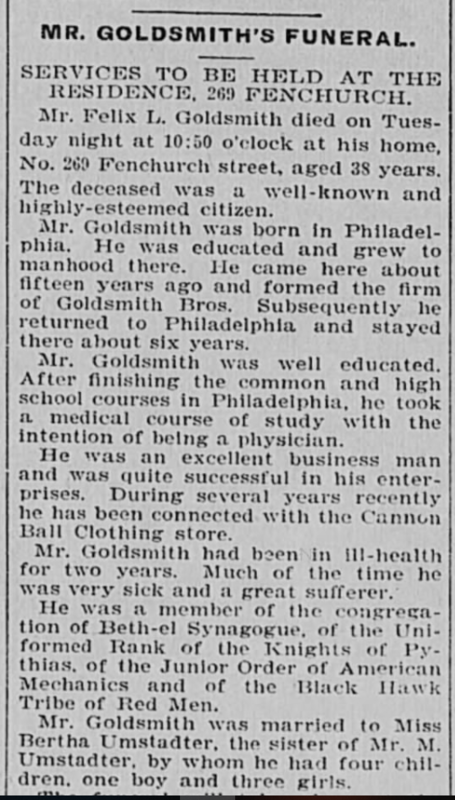 The family of Rose Goldsmith Stern certainly faced a number of challenges. But overall, they appear to have been a family that overcame those challenges, found professional success, and gave back to society in many ways. Thank you once again to Sharon and to Amberly for their help! 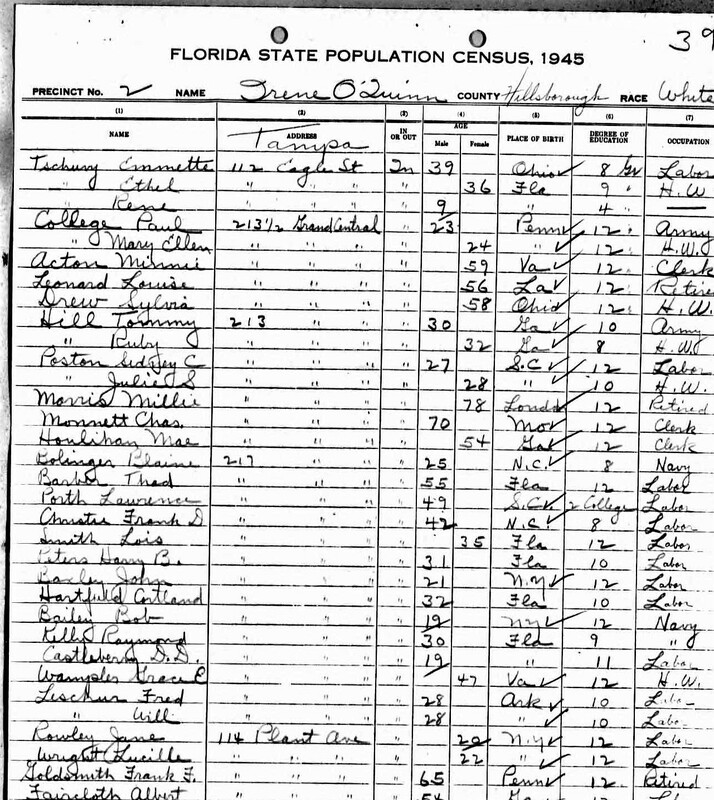 Howard Stern and family, 1930 US Census, Census Place: Philadelphia, Philadelphia, Pennsylvania; Page: 20A; Enumeration District: 1029. 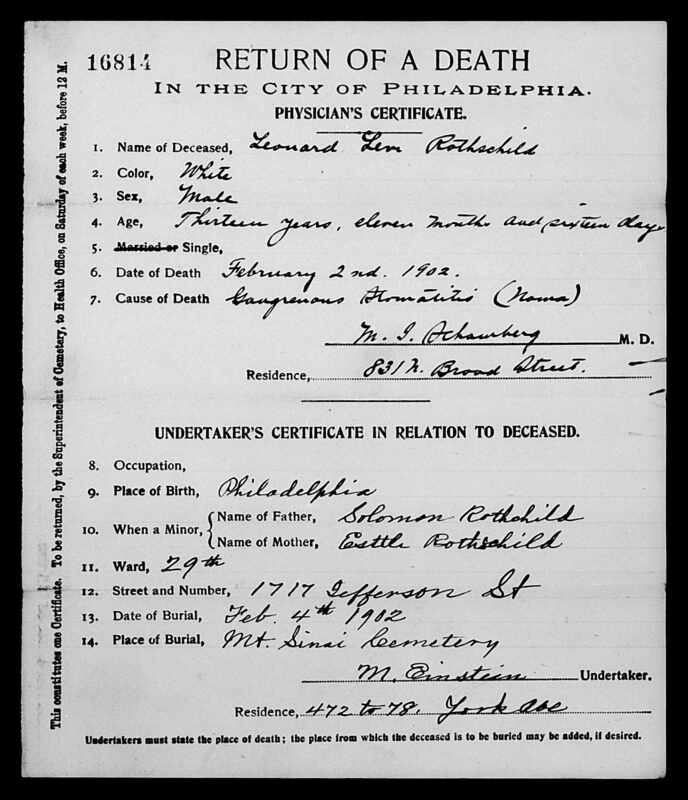 Rosenzweig Update: Who Signed that Death Certificate? 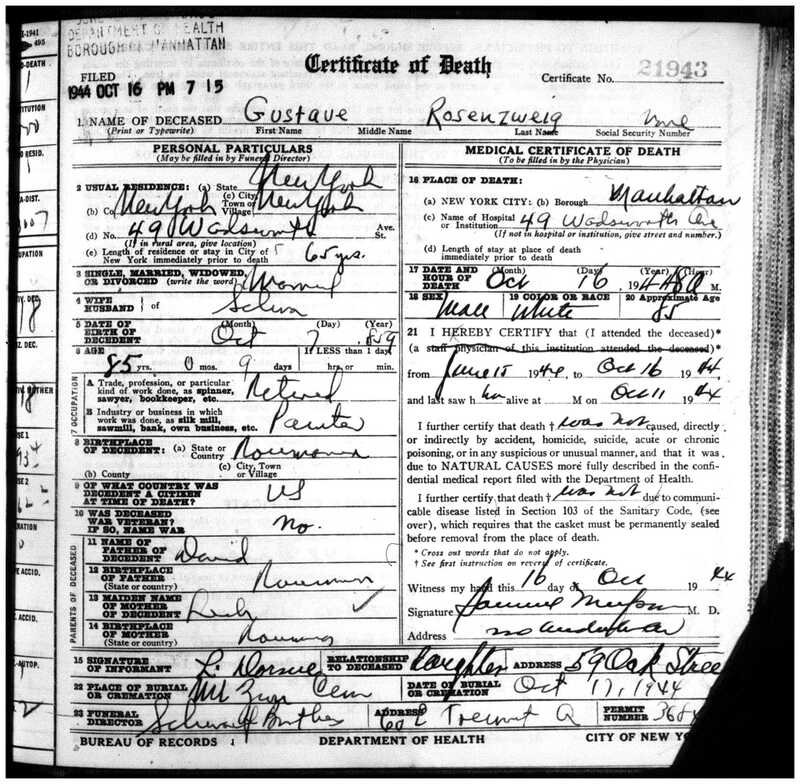 One of the biggest mysteries I encountered in researching my Rosenzweig cousins was the mystery of Lilly Rosenzweig, the first child of Gustave and Gussie Rosenzweig. Lilly was my grandfather Isadore Goldschlager’s first cousin. 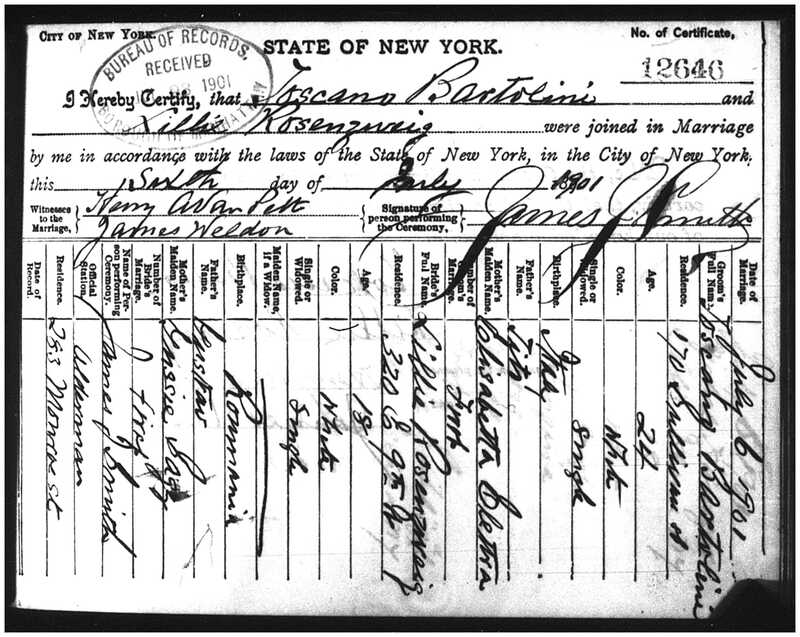 Lilly had married Toscano Bartolino in 1901 and had had a child William with him, born March 9, 1902. 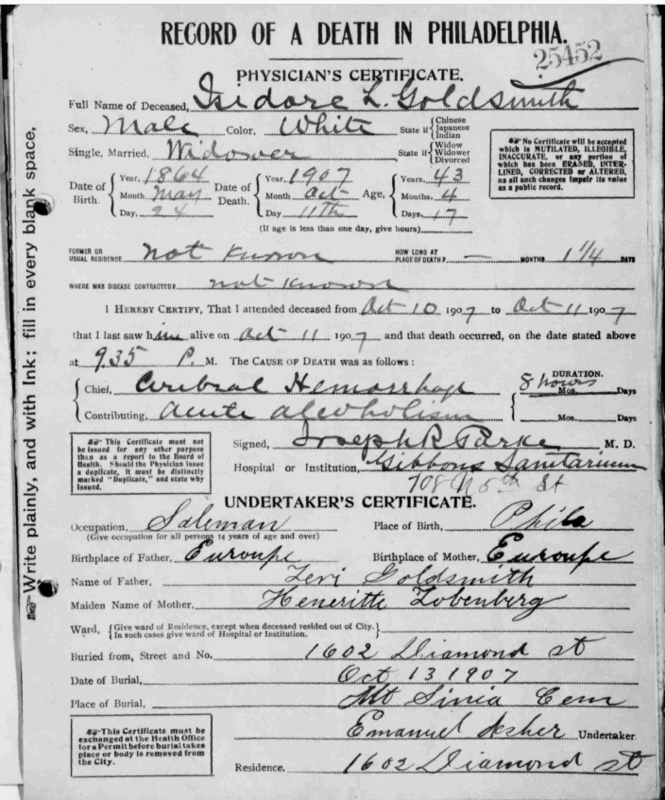 Then just two years later on April 27, 1904, Toscano had died from kidney disease at age 27, leaving Lilly a twenty year old widow with a two year old child. Lilly and her son William were living with Gustave and Gussie in 1905, but by 1910, William was no longer living with his mother and grandparents, but was in St. John’s Home for Boys in Brooklyn. 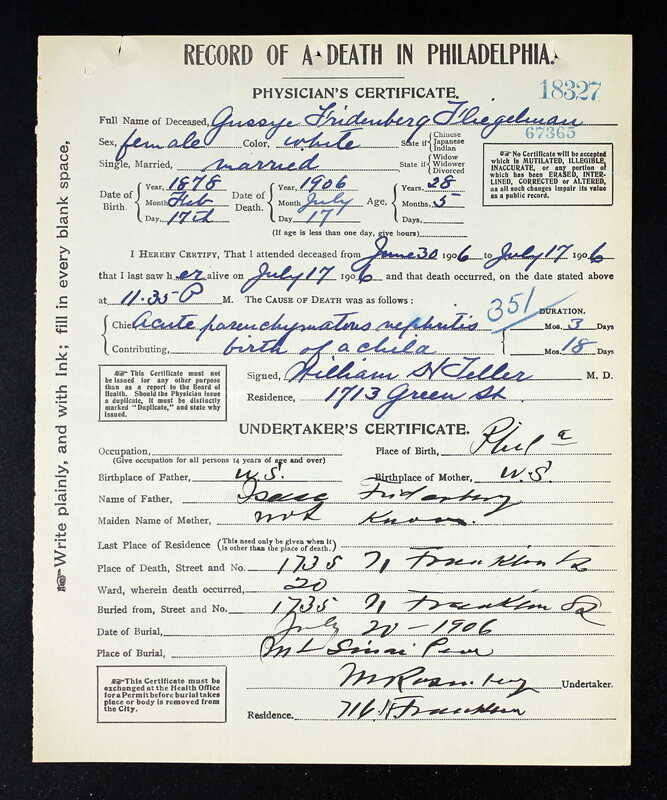 Lilly was still living with her parents in 1910 and working as a nurse. 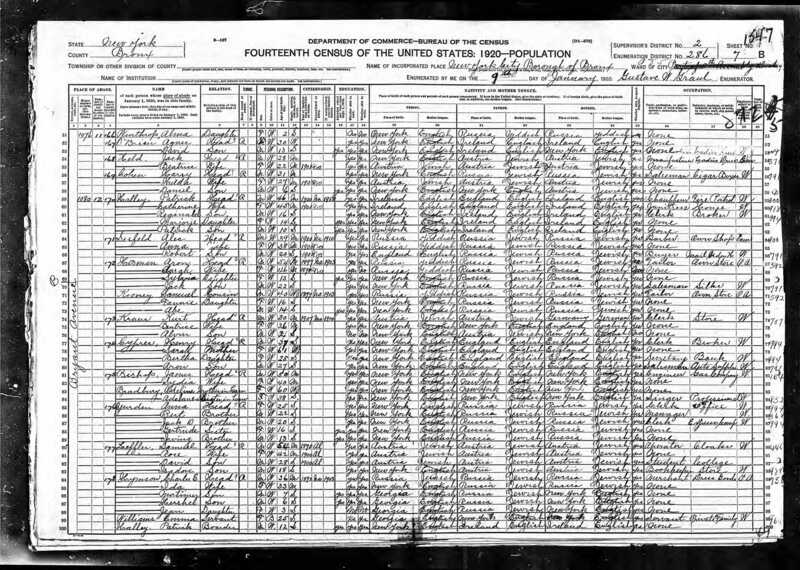 In 1915, William was at a different residential home, but I could not find Lilly at all on the 1915 NYS census nor could I find her anywhere after that. 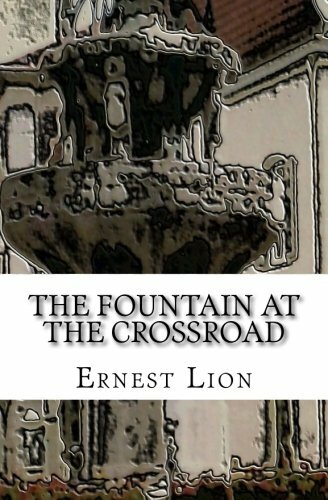 None of the great-grandchildren of Gustave and Gussie knew what had happened to her, except that they thought she had remarried and moved to New Jersey at some point. 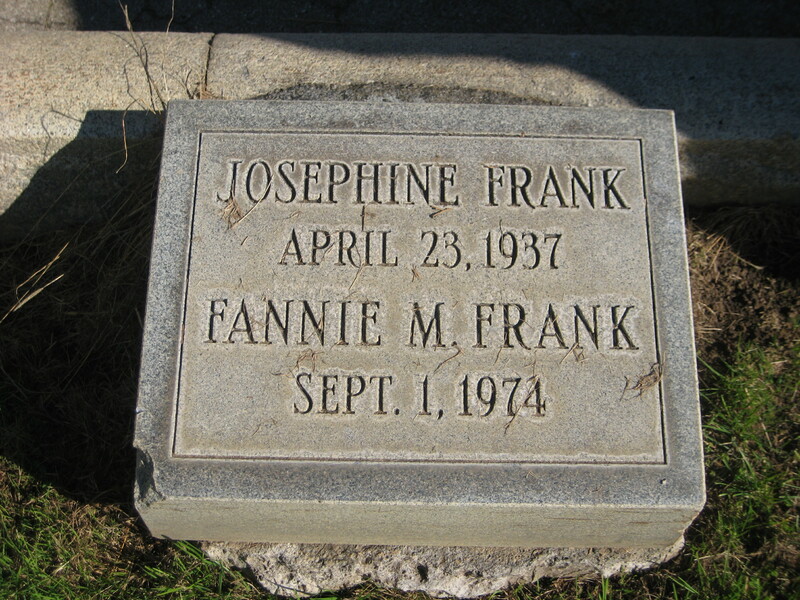 No one knew her married name or whether she had more children. I was stuck and could not get any further. 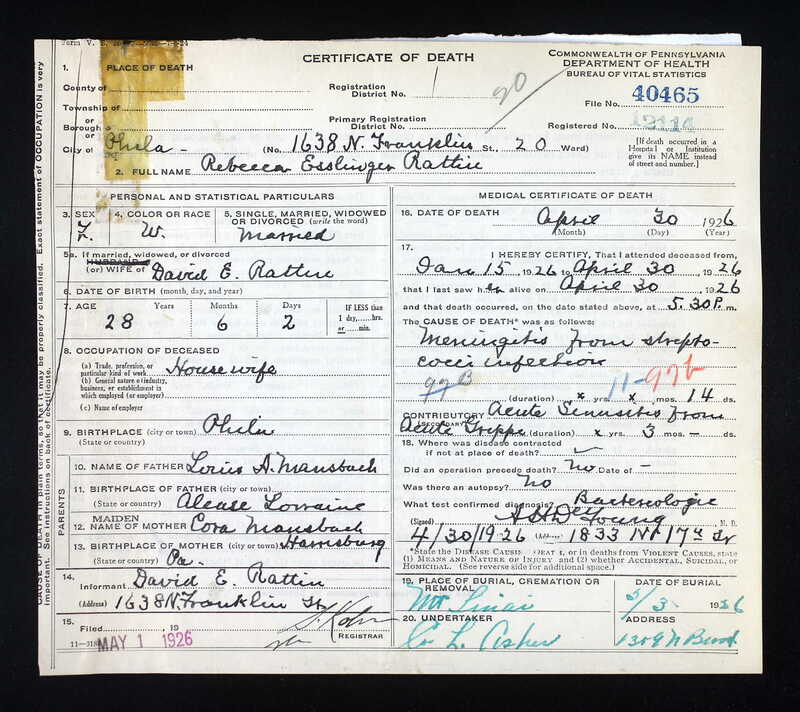 I thought I had a new clue when I obtained Gustave’s 1944 death certificate. 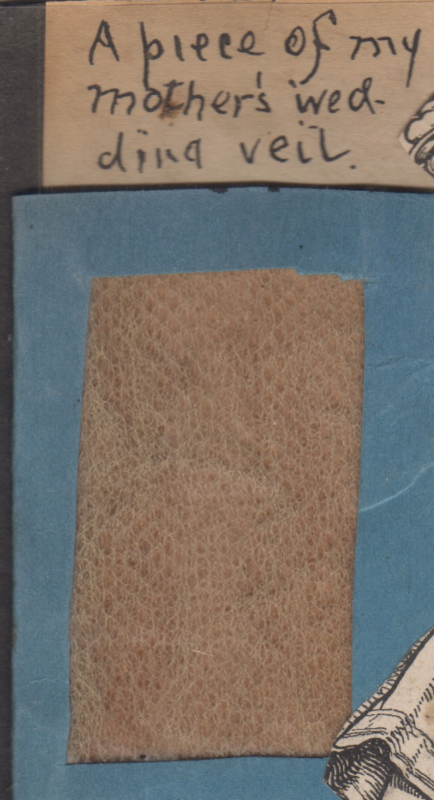 It was signed by an informant I thought might be Lilly. 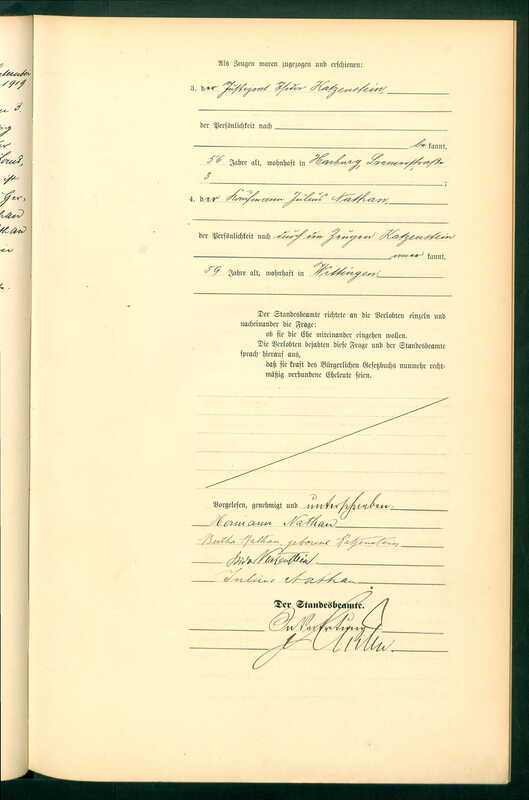 I posted the signature on the blog, hoping someone would be able to decipher it more clearly than I could, but every possible reading of the signature led me nowhere, even using wildcard searches and as many variations as I could. I put Lilly aside and figured it was a lost cause. And then? Well, this past weekend I received a call from Harriet, one of Lilly’s nieces. She not only remembered Lilly well—she remembered the first name of her second husband—Carmen. And she said they had lived in Jersey City. She remembered Lilly fondly and described her as funny and fun-loving, like all the Rosenzweig siblings. So I now had two more clues. 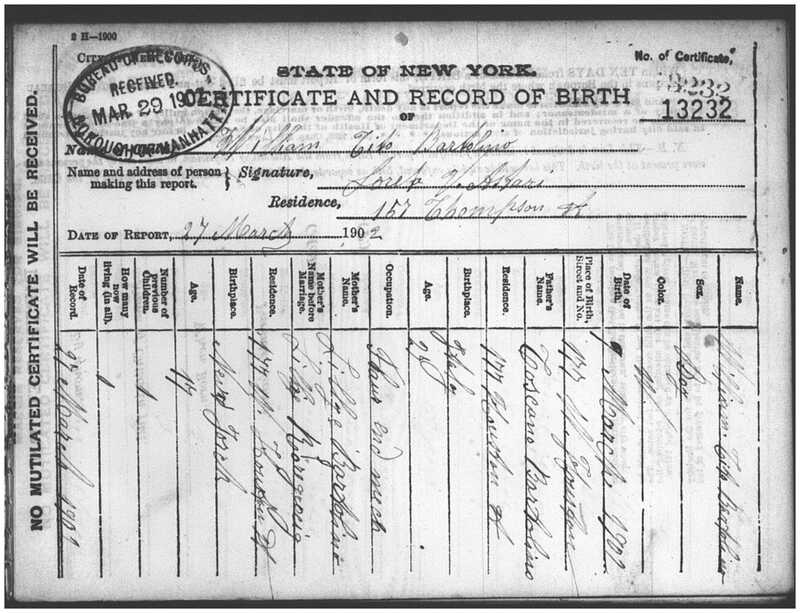 Lilly had married someone named Carmen, and they had lived in Jersey City, New Jersey. 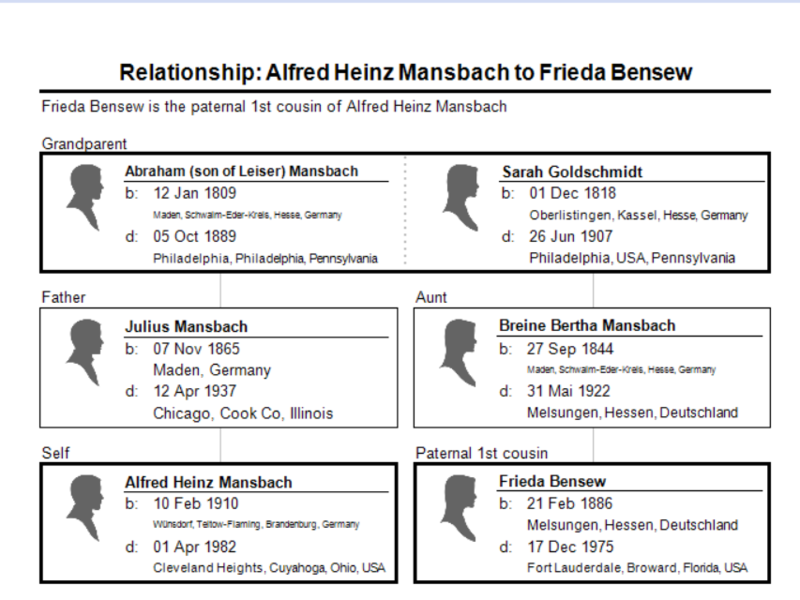 Armed with just those additional pieces of information, I was able to design a search on FamilySearch using the two first names and the location. 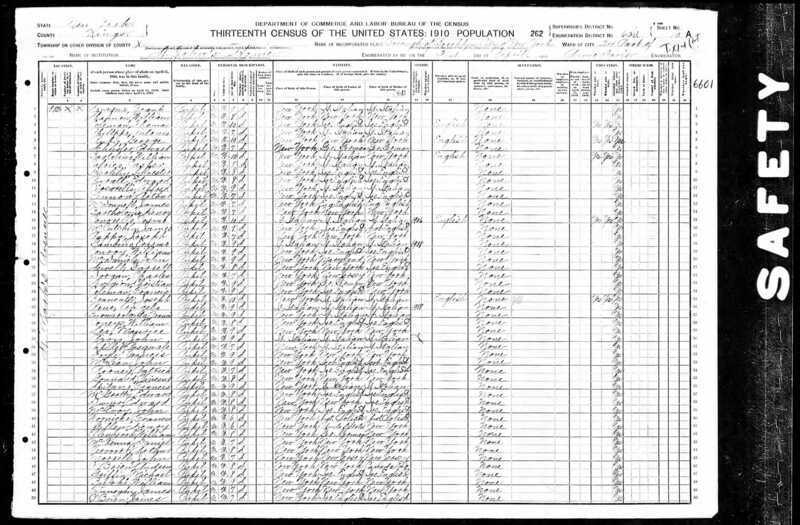 The first result on the results list was a Lilly and Carmen Dorme living in Rutherford, New Jersey in 1940. Rutherford was not Jersey City, but it was close by, so I decided to try that surname. 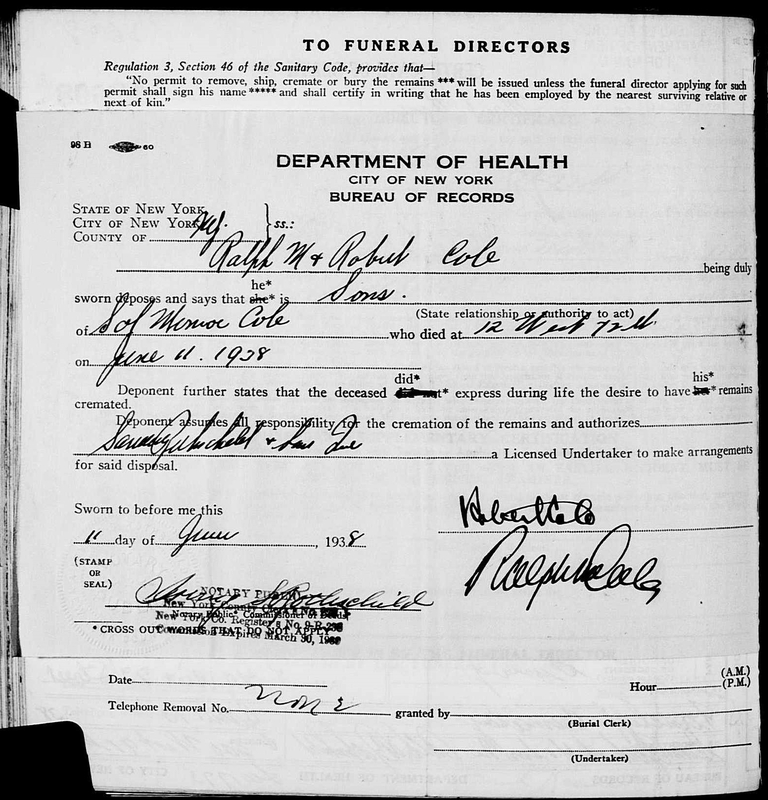 Using Dorme, I was able to search more thoroughly and found that Lilly and Carmen Dorme were already married by 1918 when Carmen (using Carmine Dormes then) registered for the World War I draft and that they were living in Jersey City. This had to be my long-missing cousin Lilly. 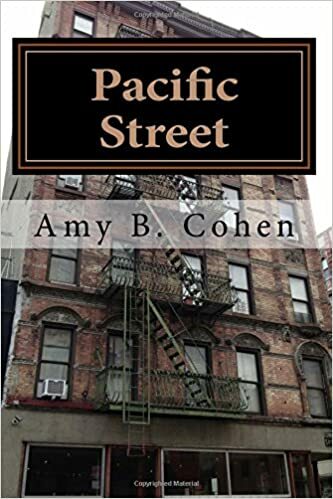 After that, I was also able to find Lilly and Carmen in several Jersey City directories and in the 1930 US census, which revealed that Lilly and Carmen had a child, Louis, who was then sixteen years old. 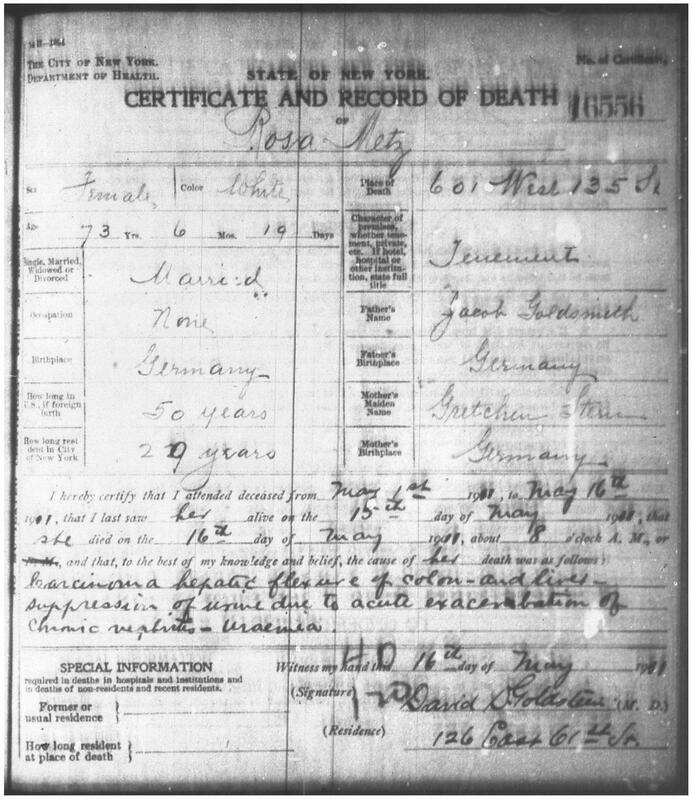 Further searching uncovered a Louis Dorme’s entry on the Social Security Death Index, indicating that he was born in New York on May 13, 1913, and had died in 1977. This was consistent with the age and birthplace for Louis on the 1930 census, so I am reasonably certain that this is the correct person. 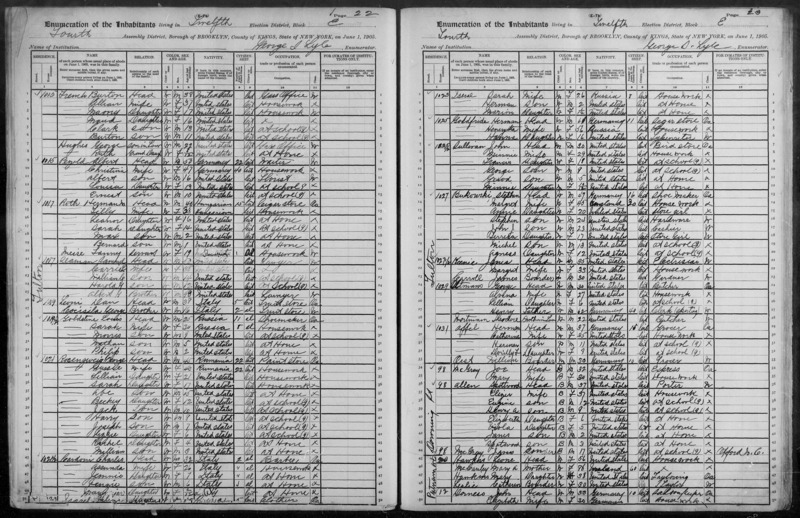 I still cannot find the family on the 1920 census, and since they were living in Jersey City both before and after 1920, I assumed that they would have been there then as well. 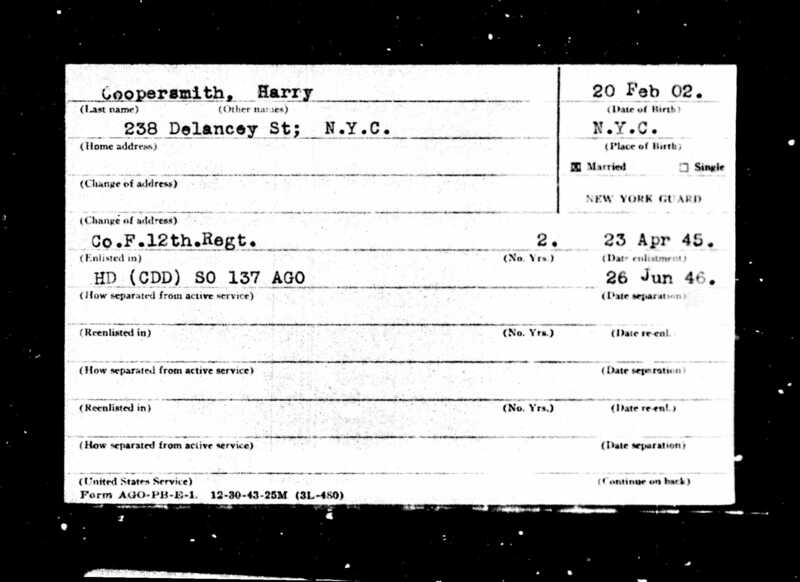 But although Carmen is listed in both the 1918 and the 1925 Jersey City directories, he is not in the 1922 directory (the intermediate years are not available online). 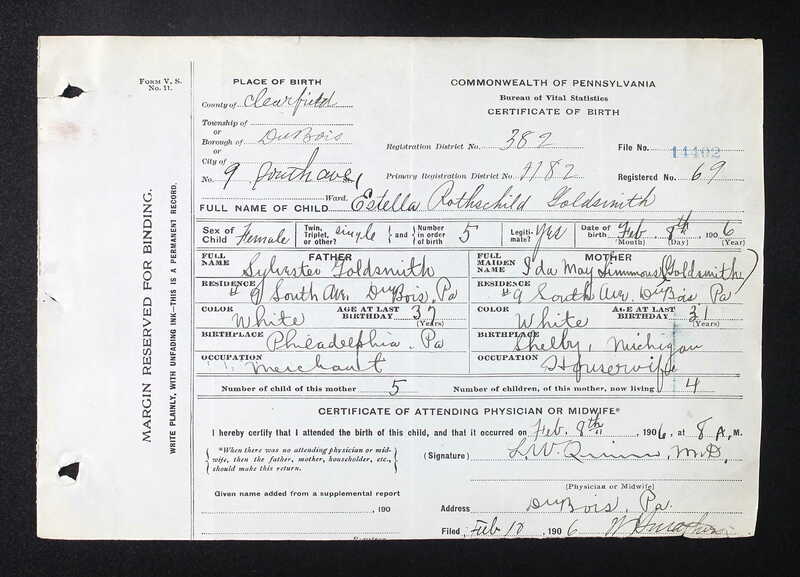 Harriet thought that Lilly had served as a nurse overseas during World War I, so perhaps that is where the family was located during that period. 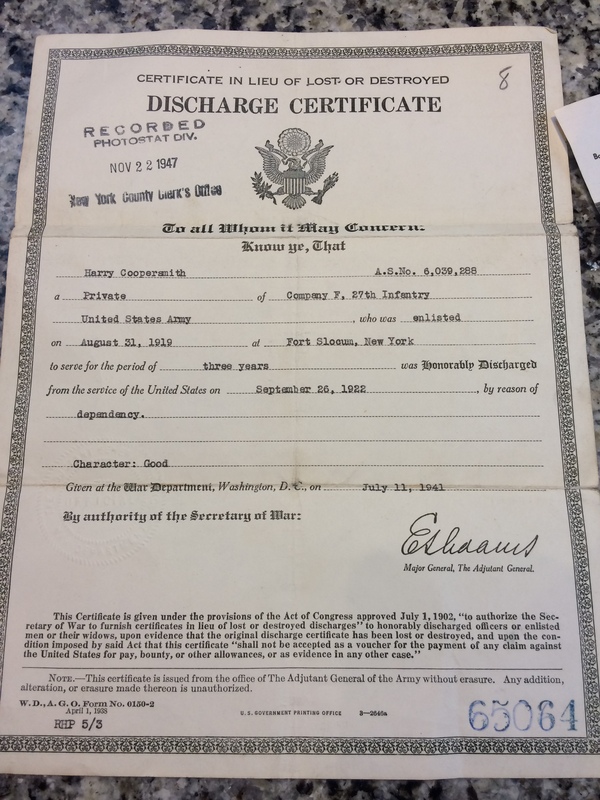 I cannot, however, find a military record for Carmen, so I have no way to know for sure where they were during that period. 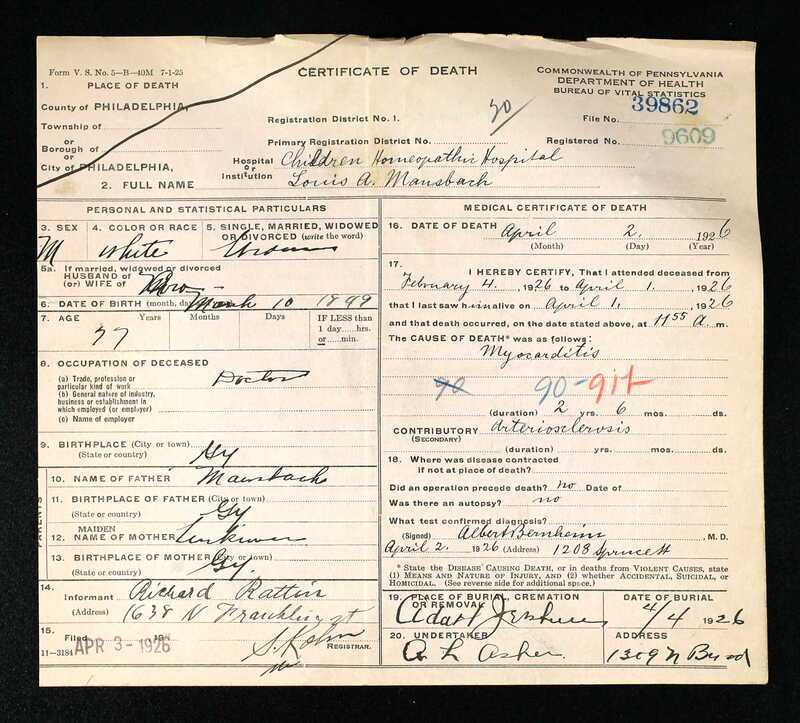 And although I do know when Louis died (1977) and when Carmen died (1962) from the SSDI, I cannot find Lilly on the SSDI nor can I find any other record of her death. Harriet does remember Lilly’s death (in fact, Harriet’s mother reported that Lilly’s last words was a request for a corned beef sandwich! ), but not the specific year or place. 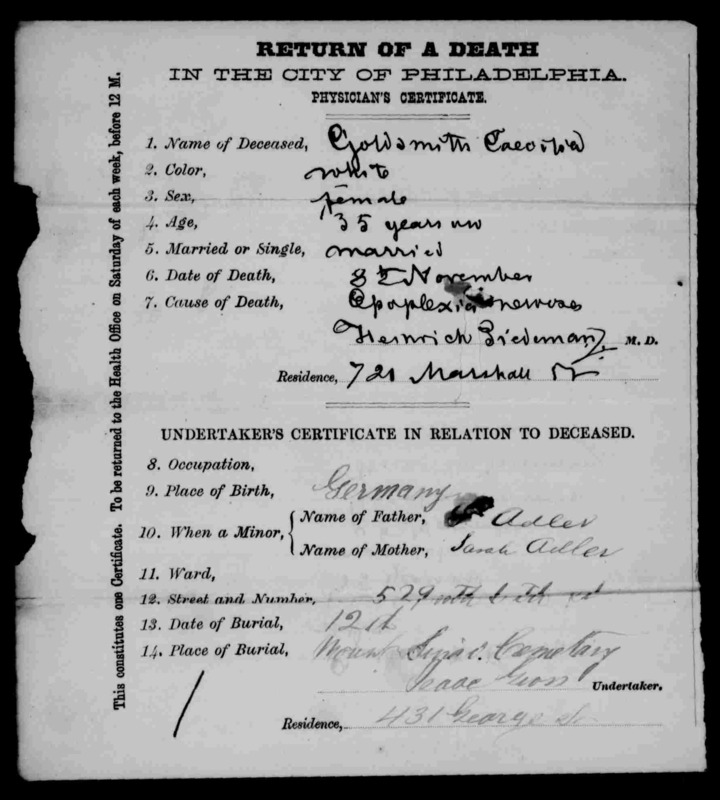 But I do have one clue, and it goes back to Gustave’s death certificate. As soon as I saw that Lilly’s married name was Dorme, something clicked in my head. 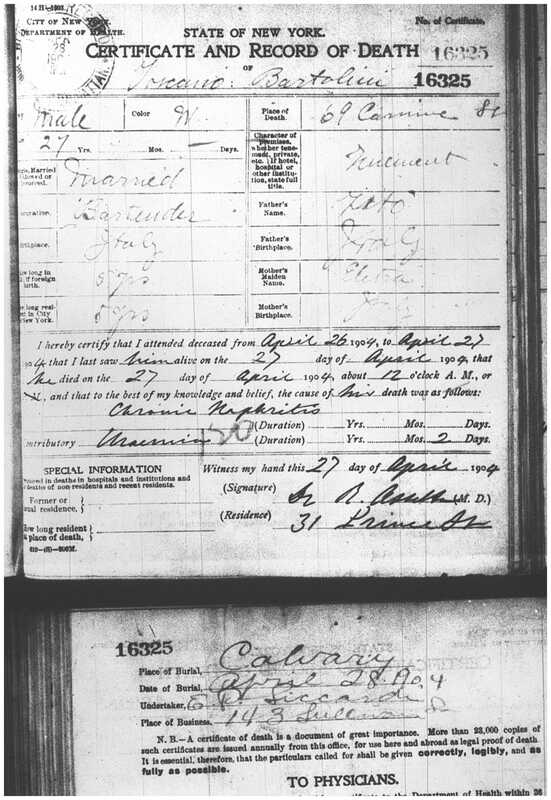 I went back to look at Gustave’s death certificate, and now it seemed strikingly clear that the informant’s name was L. Dorme. How could I not have seen that or found her before? I just don’t know. 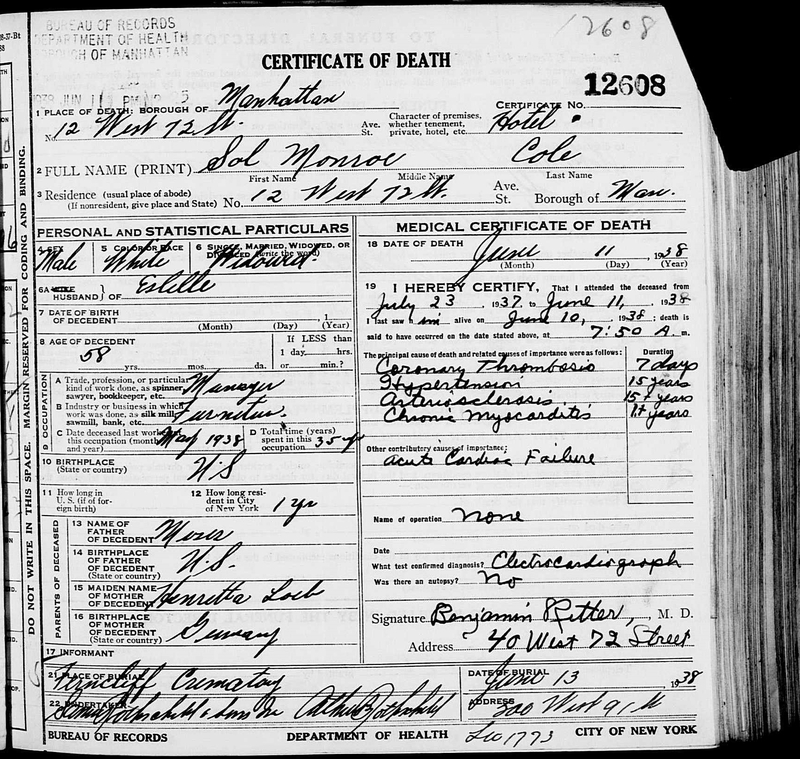 But now I knew that it was in fact Lilly who signed her father’s death certificate. 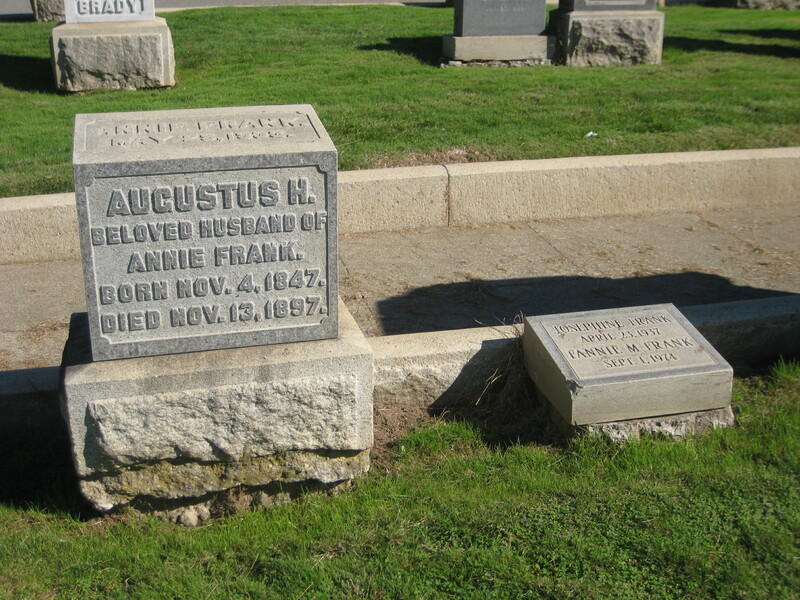 And so I know that she was still alive as of October 16, 1944, when Gustave died. 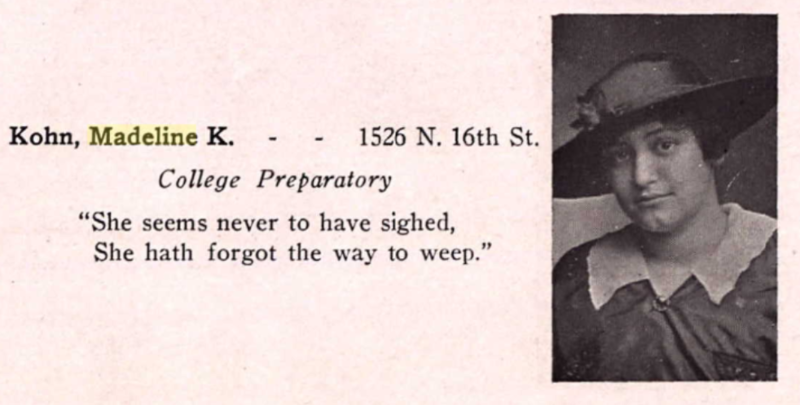 I am sure with a few more clues I will be able to narrow down the year and perhaps find her death record as well. 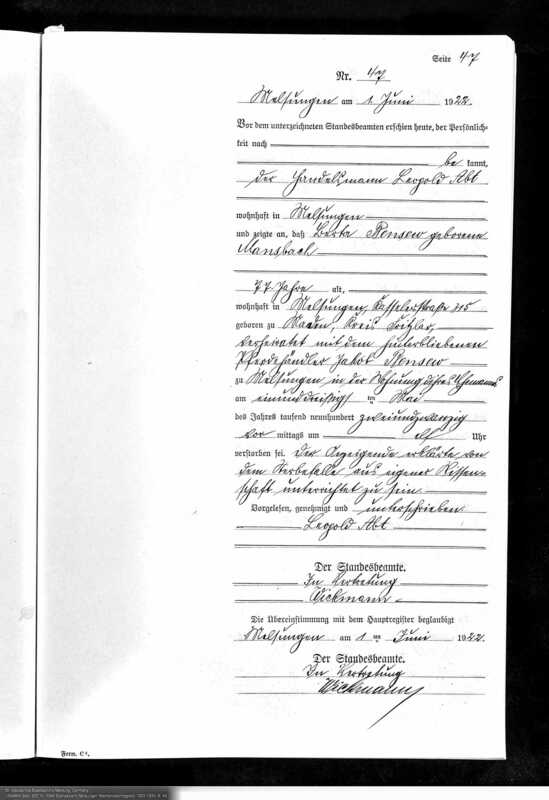 So in the space of one afternoon with the help of a new cousin, I was able to resolve one of the biggest questions I had remaining about my grandfather’s Rosenzweig first cousins. Thank you, Harriet!